The First Sign is the first of five pre-rendered cinematics in Diablo 3. The first portion of the cinematic features a flashback to the Eternal Conflict, a momentous battle between angels and demons. Originally this scene was going to be realized in the usual 3D fashion like the rest of the cinematic, but the team ultimately shied away from this because of time constraints. As the project's director Nick Carpenter said, "...it was essentially like adding another entire cinematic relatively late in the schedule." Eventually they settled on the notion of using 2D hand drawn elements to tell this part of the story. In addition to being well executed, it also serves as a good, artistic contrast to the second half of the cinematic. And because the storybook approach is not as costly to produce as the normal pre-rendered cinematics, it has enabled more opportunities for storytelling throughout the Diablo series. Blizzard has since released over a dozen short segments for Diablo 3 and its expansion Reaper of Souls using this look. A scene from The Shadow of Death cinematic. Sound design is easy to overlook, but the truth is that sound is integral to every cinematic experience. 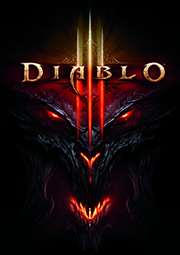 The sound team, including Paul Menichini, David Farmer and Michael Johnson, did a great job realizing both the mundane and the fantasy sound effects of the Diablo universe. Here is a version of the cinematic where the voice over and music tracks have been removed to illustrate the complexity of the sounds by themselves.